Provide comfort for the family of Akiko O'Connor with a meaningful gesture of sympathy. 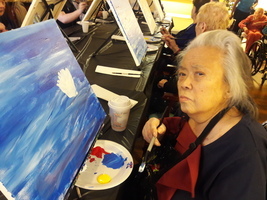 AKIKO H. “KIMI” O’CONNOR (nee Horie), age 78, passed away peacefully on December 26, 2018. Devoted wife to the late Chief Inspector Joseph E. O’Connor. Loving mother to Marie Meyers and her husband, Jim. Beloved grandmother to Isabella and Sophia. Relatives and friends are invited to her viewing Saturday, January 5, 2019, from 1:30pm until 2:30pm, followed by services 2:30pm at LOUIS A. DiGIACOMO, FUNERAL HOME, Inc., 1055 Southampton Road, Philadelphia, Interment private. In lieu of flowers, memorial contributions in Kimi’s memory can be made to Christ the King Church CYO, 3252 Chesterfield Road, Phila. PA 19114-1598. www.DiGiacomoFuneralHome.com. We encourage you to share your most beloved memories of Akiko here, so that the family and other loved ones can always see it. You can upload cherished photographs, or share your favorite stories, and can even comment on those shared by others. Your Friends at DSA sent flowers to the family of Akiko "Kimi" O'Connor (Horie). Kimi will never be forgotten by me and all who knew her. She was vibrant, compassionate and so funny. When I was with her she chased the clouds away with her contagious laughter and cheer. I am so sorry for your loss but hope you will be comforted knowing she is with your dad in a better place. Sending love to you, (Marie) Jim and the girls! Your Friends at DSA purchased the Bright and Beautiful Spray for the family of Akiko O'Connor. Marie, another good person gone, but take comfort in knowing she’s with her love. I often remember your dad telling us stories of first meeting Kimi. When he kissed her, the earth trembled. Dad said that was a sign he should marry her. Know you and your parents are in my thoughts and prayers. I love you, Cuz. Cheers with her girls at the Manor!